“The entire team was very informative, helpful, polite, and professional. They went above and beyond to be sure that I knew what to expect during the cleanup process. All of my parent’s belongings were packed and taken care of as if it were their own. 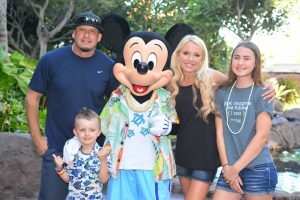 The damage to the house was extensive, and the conditions in the house were hot and uncomfortable, but they continued to work without complaint. 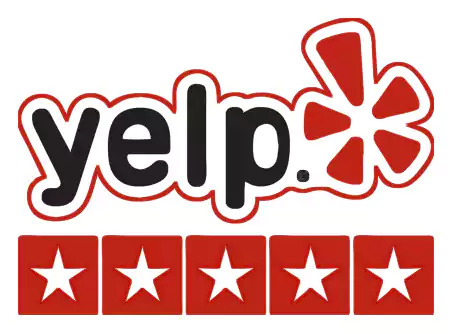 I would definitely recommend them to anyone that finds themselves in the same situation,” – Kathleen C.
View all our 5-star reviews on Google, Facebook, Yelp, Mapquest, and BBB. At ServiceMaster By Johnson, we provide superior water damage restoration services. We work in homes and offices correct issues that result when moisture or water builds up. In many cases, Roseville water damage can require immediate service and our crew is able to arrive promptly to start the restoration process as soon as possible. In no time at all, damage caused by water can be devastating. If the damage isn’t handled right away, it can lead to even more problems and headaches down the road–including expensive repairs or dangerous mold issues. You need to address the standing water right away in order to prevent potential health problems. The water needs to be removed and all affected areas completely dried out by our certified water restoration professionals that are equipped with the correct equipment to find and locate any moisture that is hiding from view. 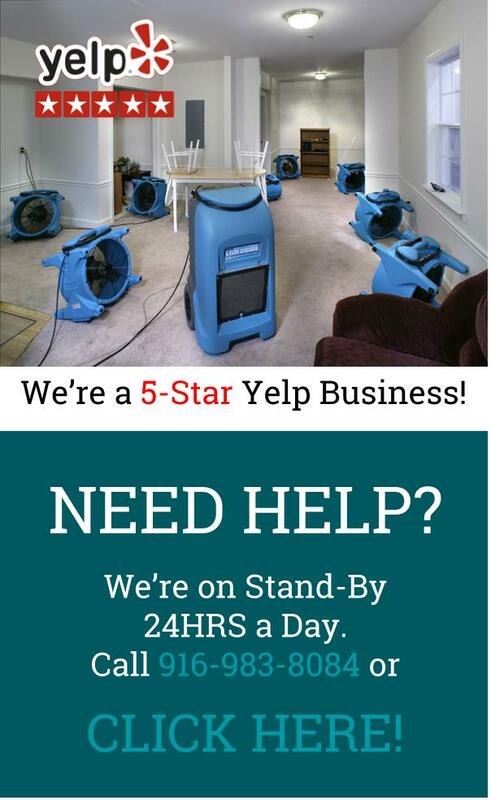 ServiceMaster will handle all of your water damage cleanup throughout Roseville and the surrounding area. From water removal and extraction to complete restoration, from any emergency that may arise, whether it be broken or leaky pipes, sink overflow, toilet overflow, refrigerator, washing machine, water heater, or dishwasher malfunction, or crawlspace and basement water damage. 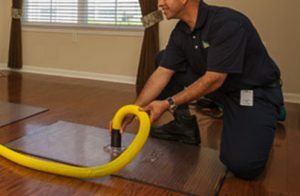 Our Roseville water restoration technicians are highly trained and certified in the latest home restoration and remediation techniques and technology. 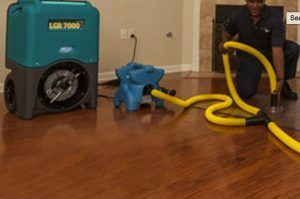 We have the proper equipment and certifications to completely handle your water damage problem from start to finish, no matter the cause. If you have flood damage in Roseville, we suggest you take the following steps to help eliminate more severe structural damage or the development of mold. If the source is visible and safely accessible, shut off the main valve or close the window or door from which water is getting into the property. Leave any books, magazines, or other colored items on wet carpet or floors. In addition to providing water damage Roseville, we also provide sewage damage cleanup and sewage removal services. Only trained professionals should handle sewage cleanup as raw sewage is difficult to mitigate, extremely dangerous and contains high amounts of harmful bacteria. Coming in contact with raw sewage can cause disease and severe damage to your property and valuables. In addition to being there when you need us most, our knowledgeable and experienced technicians can also educate you on what you should do and not do to keep the flood or sewage damage as minimal as possible. If your home or office has experienced sewage or water damage, don’t wait to get in touch with us. We have 24/7 emergency service and our team is standing by to help. We provide services to Roseville CA including: 95661, 95677, 95678, 95746, 95747, 95765. The settlement was originally a stage coach station called Griders. According to the Historical Society, in 1864 the Central Pacific Railroad tracks were constructed eastward, and when they crossed a small California Central Railroad line they named the spot “Junction”. Junction eventually became known as Roseville. In 1909, three years after the Southern Pacific Railroad moved its facilities to Roseville, the town became an incorporated city. What followed was a period of expansion, with the community building more than 100 structures, including what was the largest ice manufacturing plant in the world (Pacific Fruit Express building, in 1913). The city was a railroad town for decades, with the railroad employing up to 1,225 people by 1929, out of a population of only 6,425 people. With the onset of World War II, the rail yards became busier than ever, and the post-war building boom brought continued prosperity. However, the nature of the city changed dramatically in the 1950s. Roseville is home to attractions such as Maidu Museum & Historic Site.